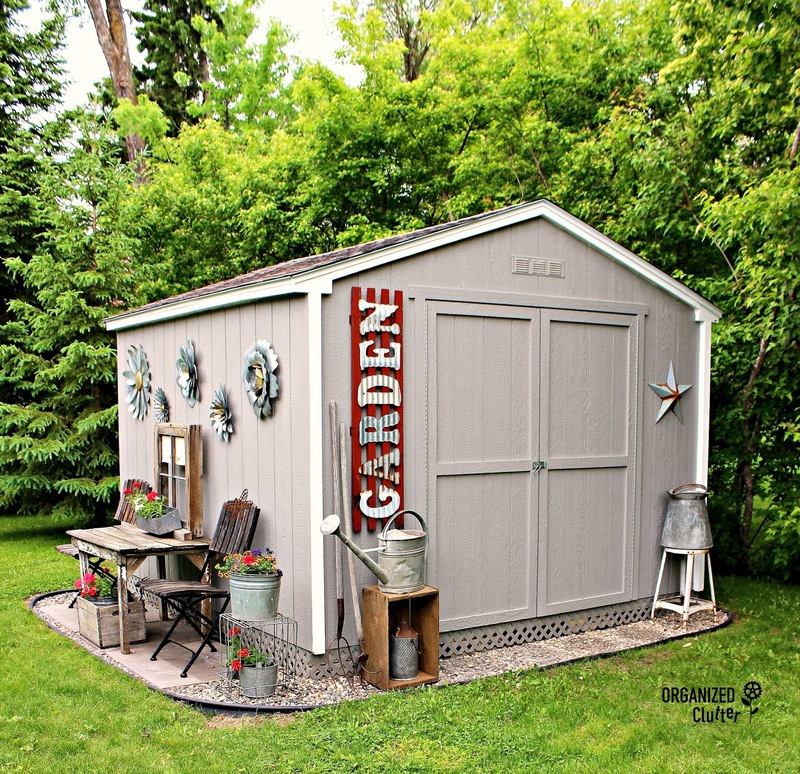 Late last summer, I purchased a Princeton 10' x 10' shed kit from Home Depot. My husband put the kit together with a few reinforcements to the floor and door to make it stronger. The shed sat all winter unpainted and un-landscaped. Here is the shed early this spring. 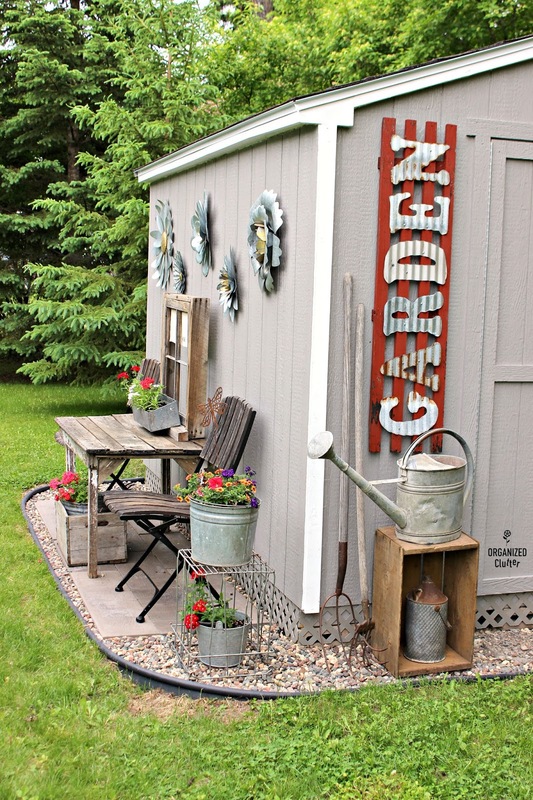 The shed was sitting on cement blocks and shims, and definitely needed paint and landscaping. Have you ever removed sod to make a flower bed? These are the tools we used. A spade to remove sod, and an ax to remove large tree roots. My youngest daughter helped her mom, with bad knees, on Mother's Day weekend with this project. I showed her this You Tube Video on sod removal prior to our project. We only removed sod on the one side and the front of the shed. After removing the sod, my daughter put in plastic landscape edging from Menards. Even though black landscape edging is boring and plain, it keeps out most grasses, and I use it often. I used black landscape fabric under Nurserymen River Pebbles. I had the four round stepping stones already from a different flower bed. I purchased some heavy weathered wood look pavers at a local nursery. We enlisted my husband's help to level the pavers. They were very heavy. 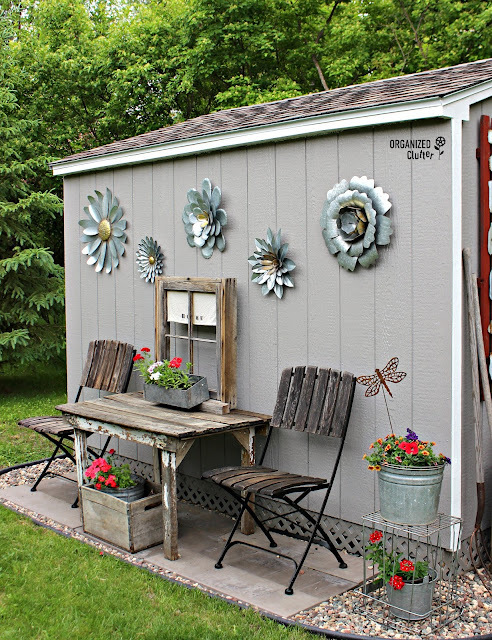 My husband also painted the shed a gray color and added matching lattice to the bottom to cover the cement blocks. I found this rustic table while junking this spring. I sealed it with THOMPSONS WATERSEAL Wood Protector . Now to put it all together! I put the cement pavers on one side to anchor a little seating area with the two bistro chairs that match my stenciled deck table. 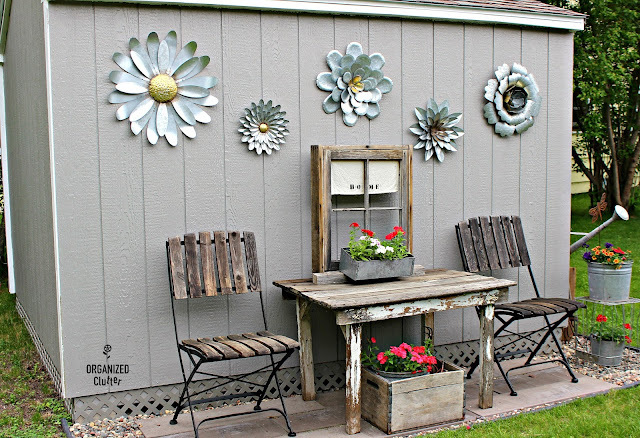 The flowers are Kalalou Galvanized Metal Flower Wall Hangings, Set of Five . (And available through Amazon) The window frame flower box has been on my Christmas mantel and above my potting bench in previous years. The garden shutter sign is a project from last summer. I'm pretty happy with the way it turned out! Thanks to my helpers too! I will re-visit the shed during my annual garden tour after the flowers fill in. Love it!! I wish I had a junk shed other than my garage! Hi, Carlene. I am writing an article for TheSpruce.com about garden sheds and would love to use the 12th photo down as an example. I would, of course, give you credit and a link back. Please let me know if this would be okay with you. Thanks.